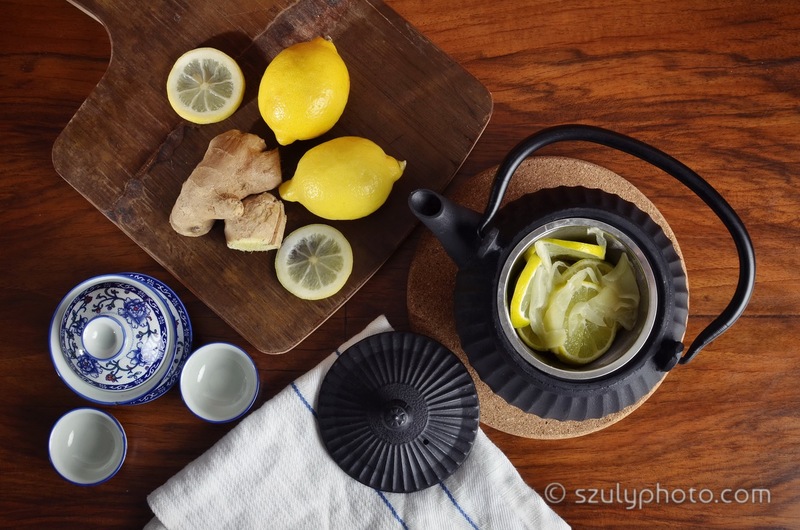 Stock photo project, covering the theme of lifestyle and relaxation, through drinking fresh, organic ginger & lemon, and Chrysanthemum tea. 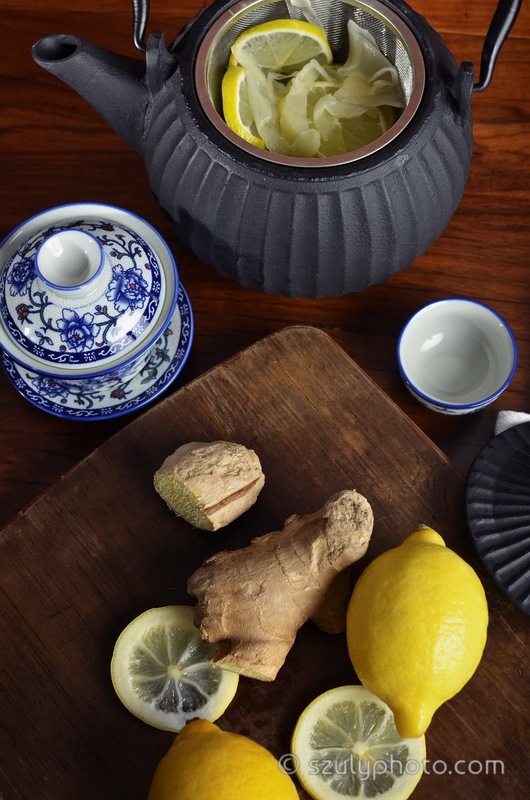 The series is shot in a studio environment, it includes a black iron tea cattle with a built in metal tea strainer (filter), a white Chinese tea set with one pot and two cups, a dark brown cutting board, a white linen kitchen cloth, a glass jar filled with Chrysantemum tea flowers cut ginger and fresh lemon pieces. The set is shot in front of a dark brown background with one main and one fill light studio strobe. This photo series is licensed and can be downloaded from my Creative Market shop. For stock project arrangements, contact me via email, or use my new online booking feature! 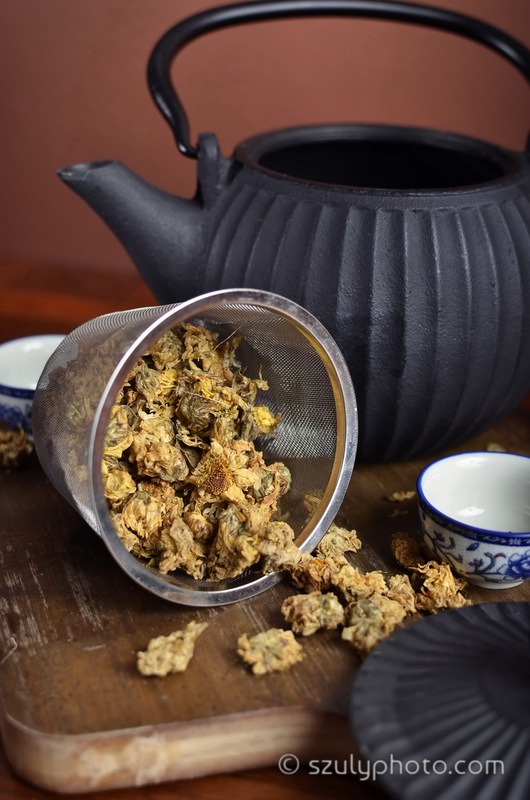 Side view of a tea strainer with chrysanthemum tea flower in it, accompanied by a white chinese tea set, a black iron tea pot on a wood cutting board in the background. 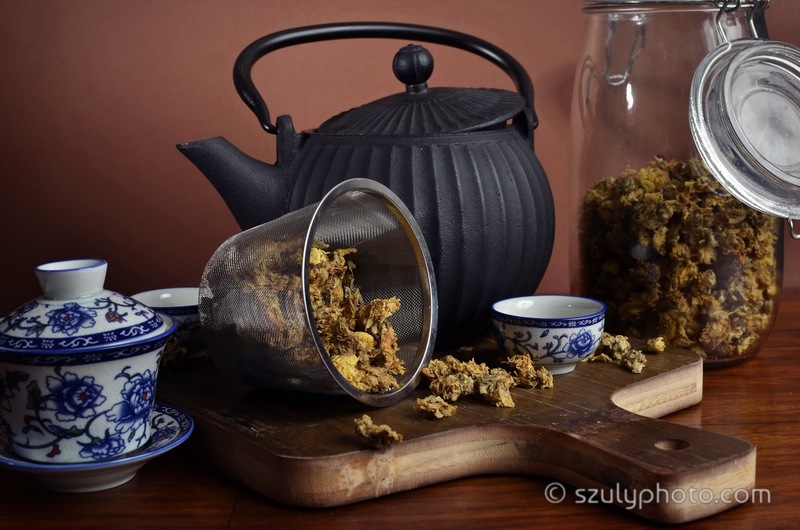 Side view of a black iron tea pot, accompanied by a white chinese tea set and a tea strainer with tea in it, on a wood cutting board, with a glass container in the background with chrysanthemum flower tea. 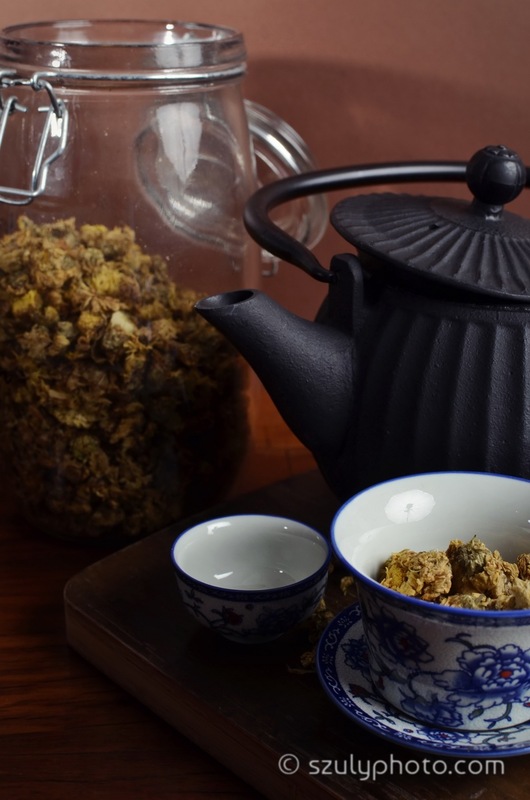 Side view of a black iron tea pot, accompanied by a white chinese tea set on a wood cutting board, next to a glass container with chrysanthemum flower tea. 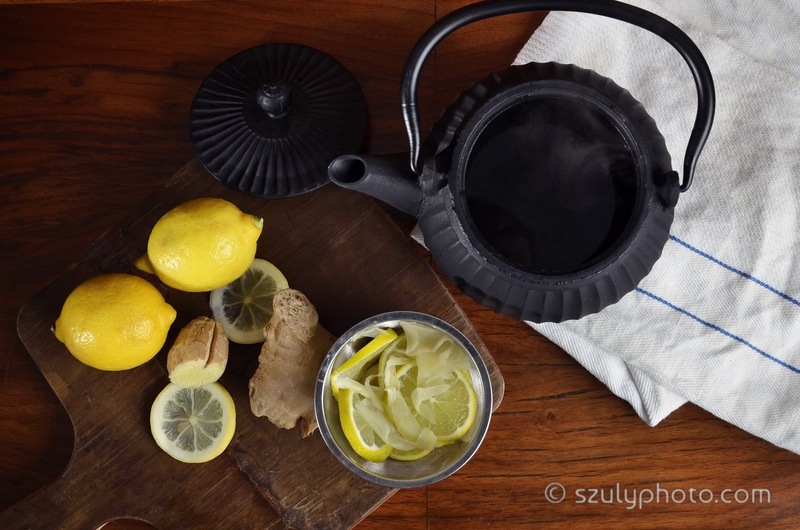 Overhead view of a black iron tea pot with hot water, fresh ginger and lemon on a cutting board, a white kitchen cloth and a white Chinese tea set with two cups on a dark wooden table. 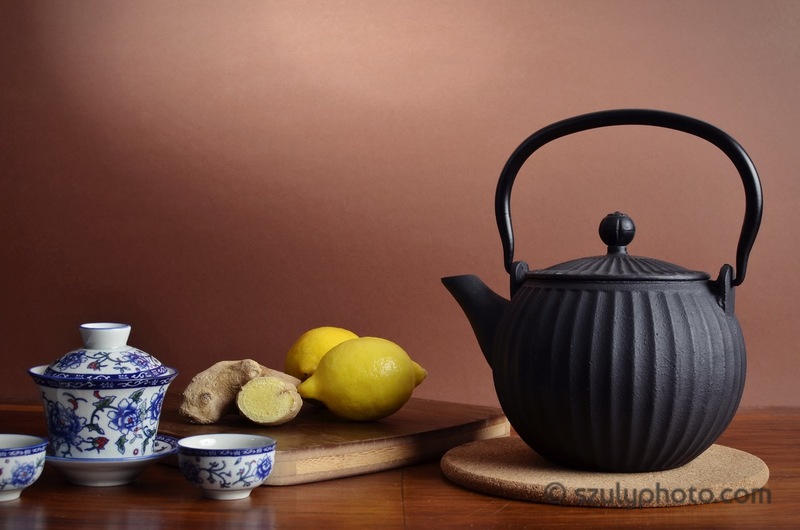 Overhead side view of a black iron tea pot, fresh ginger and lemon on a cutting board, a white kitchen cloth and a white Chinese tea set with two cups on a dark wooden table. 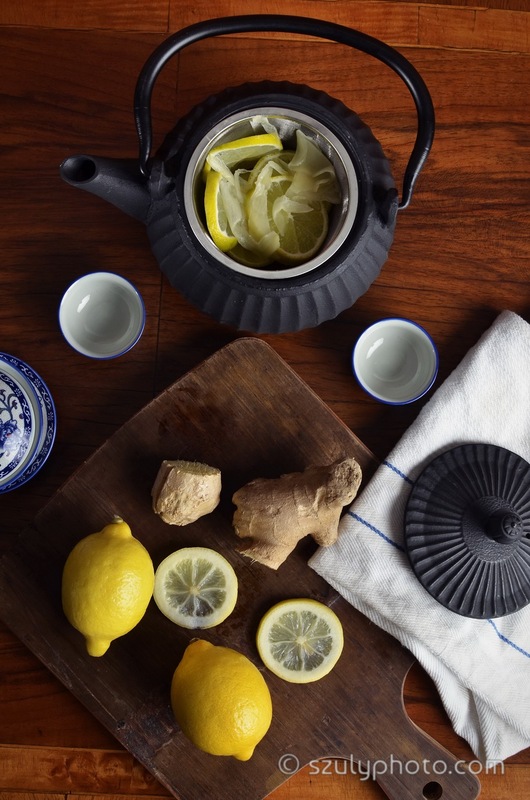 Overhead view of a black iron tea pot, fresh ginger and lemon on a cutting board, a white kitchen cloth and a white Chinese tea set with two cups on a dark wooden table.